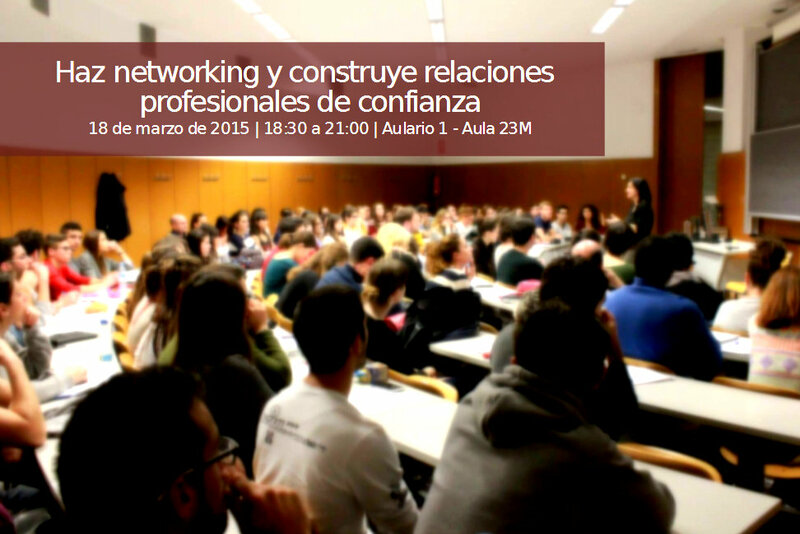 Within the framework of the program improving your employability, next March 18, 2015, from 18:30 to 21:00, in the Lecture 1 - classroom 23 M, will conduct the session get networking and build relations of trust. We know what networking is and why it is important to have a network of contacts; some keys to build a network of contacts; social networking as cornerstone in the construction of social networks and the importance of your elevator pitch: your business card. The session will be given by Isabel Iglesias, a degree in law from the Autonomous University of Madrid and a Masters in HR in the CEF. His interest in the search and the development of talent in organizations led him to form in NLP, Coaching, and DBM. It is currently Associate Director of La Caixa Foundation Human Resources, spin-off from the union between his two passions: social networks and human resources. He collaborates on a regular basis as rapporteur and forming at various universities and business schools such as the University of Alicante, the join, Esic or Fundesem. Is also co-author of the book "The dilemma of the Executive", a book on leadership and management of people where is approached differently situations which can face anyone in an organization.